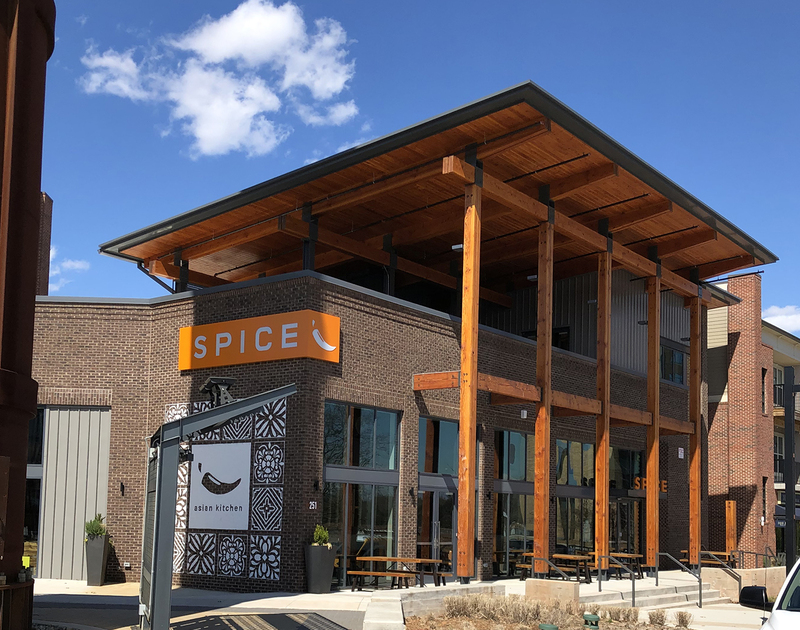 Located in Fort Mill, SC, Spice draws its inspiration from the bold and savory flavors that are characteristic of each of the different regions in Asia. By infusing these exotic flavors into locally sourced ingredients to create familar dishes, we want to transform the Asian cuisine that we've all grown too accustomed to, into a unique and refreshing dining experience. So join us, we'd love to show you our latest creations. Happy to call Kingsley home. 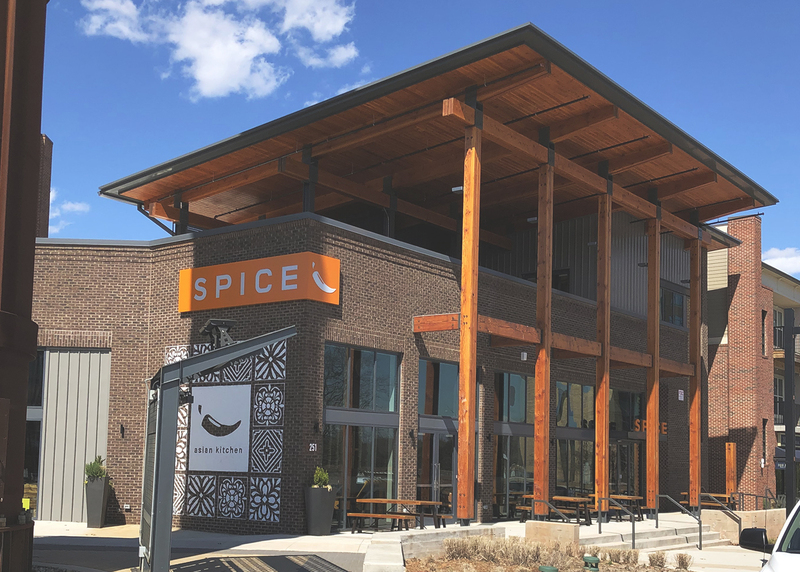 Spice sits in the heart of Kingsley Town Center with unobstructed views overlooking the amphitheater and pond from our roof top terrace bar. Grab one of our quenching cocktails or delicious desserts and enjoy the summer breeze. Every dish consists of a progression of beautiful ingredients marinated and seasoned with aromatic herbs, cooked to perfection and served with a harmonious balance of flavor and texture. Select from your favorite dishes of Dumplings and Pad Thai or trying something completely different like Bibimbap, Bossam, and Curry. Which ever you pick, we're sure you'll experience a delectable burst of flavor. Chicken morsels perfectly seasoned conbined with minced bamboo shoots and water chestnuts, encapsulated in a thin wrapper. When pan fried the natural juices along with the szechuan chili sauce, provide a flavorful crispy bite. For an alternate textural experience, try it steamed. Made to order. Freshly cleaned mussels sauteed with onions and garlic, the pan is then deglazed with a rice wine and simmered in a conconut cream green curry until the each mussel is perfectly cooked and coated with the rich flavors of the curry. Fresh big eye tuna is cubed and doused in a ponzu marinade, garnished with pickled onions, diced tomatoes, sliced radish, and chopped scallions, served over a bed of fried crispy wonton wrappers and finished off with a spicy saracha aoli. One of the most iconic Korean dishes. 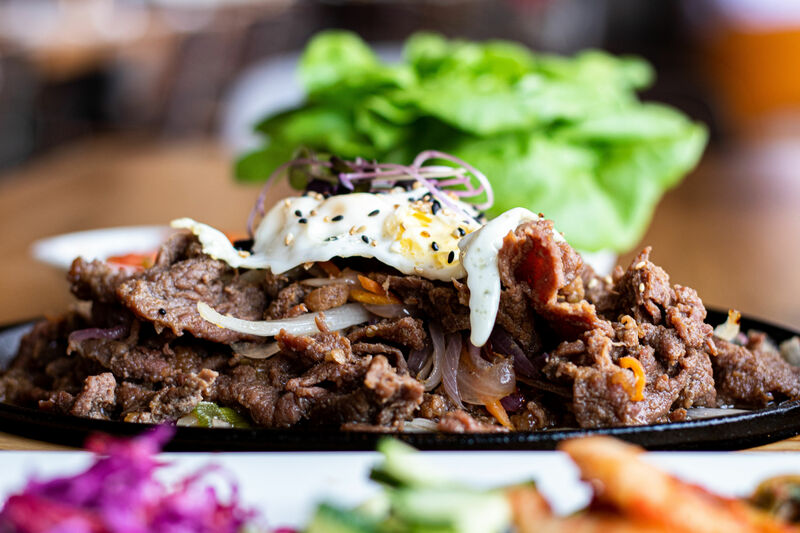 A mixture of sauteed and pickled julienned seasonal vegetables, thinly sliced sauteed marinated ribeye steak, a fresh egg, and topped with gochujang chili paste. An unforgetable spectrum of seared flavors are created as the ingredients are combine in the molten stone bowl. Thinly sliced chicken breast, stir fried with a medley of seasonal vegetables and Thai basil, in a bold peppery sauce. Served with a delicate sunny side up fresh egg over a bed of steamed rice. Another quintessential Korean dish. Tender cross slices of short ribs, marinated in a sweet soy garlic sauce for 24+ hours, then perfectly grilled over searing heat to lock in the savory flavors, finished off with a marinate glaze and garnished with crispy scallions.